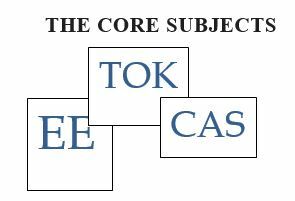 Theory of Knowledge: (TOK) is a seminar on epistemology, or how we know, that meets throughout the two-year program. The Extended Essay (EE): Following junior year and into senior year, diploma candidates do independent research in a subject of their choice, culminating in a 4,000-word paper. Creativity, Activity, Service (CAS): Over the course of the two year program, diploma candidates perform 150 hours of CAS. This includes community service, arts, athletics, civic organizations and participation in clubs.